Many people believe that simple, non-surgical facial procedures can correct all signs of aging and provide the lasting, youthful beauty we all long for. 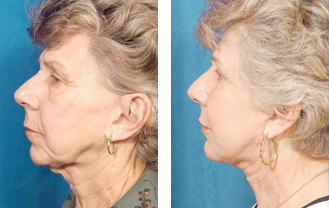 However, the truth is, the correction of facial aging often requires significant structural modifications to the neck and face, and a level of intensity that non-surgical techniques simply cannot provide. Filling in wrinkles and fine lines around your mouth and eyes won’t give you the appearance you want if your jowls are sagging and you have a double chin. A good plastic surgeon understands the importance of taking a comprehensive corrective approach and will consider the impact that small changes to one part of the face and body can have on your overall appearance. One example of the underlying structural changes associated with facial aging is the separation of the platysma muscles that run along the front of the neck. As the platysma muscles pull away from the midline of the neck, unsightly vertical cords (bands) become increasingly prominent along the length of the neck. Frustrated by the limitations of traditional neck lift techniques to address vertical neck banding, Dr. Brent Moelleken created and trademarked a signature procedure—the Necklace® neck lift (a.k.a. Necklace® platysmaplasty)—to address this specific structural consequence of the aging process. Dr. Moelleken’s extensive facial surgery training includes board certification in both plastic and reconstructive surgery, and he is one of only three surgeons in the world to complete a year-long Aesthetic Surgery Fellowship at UCLA, making him uniquely qualified to perform complex facial surgeries such as the Necklace® neck lift. 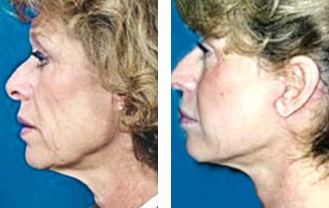 Performed on an outpatient basis at the pristine Moelleken Plastic Surgery facilities, Dr. Moelleken’s trademarked Necklace® neck lift technique can be used to permanently reduce or eliminate the appearance of neck cords and to elevate the soft tissues below the jawline, thereby significantly improving the contours of the neck. Whether performed as a stand-alone procedure, or in conjunction with other facial rejuvenation services, a Necklace® neck lift can radically improve your overall appearance and permanently restore a more youthfully lifted neckline. Dr. Moelleken’s Necklace® Neck Lift is specifically designed to address the aging of the platysma muscle and to correct the appearance of vertical banding in the neck. When we are young, these muscles are joined at the center of the neck, but the musculature begins to separate as we age. During a traditional neck lift, these muscles are simply tightened down the center. Dr. Moelleken prefers to interweave the two sides of the platysma muscle together in a much broader fashion, much like a ‘shoe lace’ being tightened. He believes this distributes the tension to a larger surface area, and lessens the tension on any given suture placement site. The Necklace® procedure requires the creation of lateral traction on the platysma to create a “sling,” which elevates the soft tissues below the jaw. By weaving the muscles together, the tension required to form this sling is distributed across two points instead of just one. This minimizes post-surgical complications; creates a smoother, more permanent result; and significantly improves the angle of the neck. The Necklace® Neck Lift is performed on an outpatient basis, either using general anesthesia or intravenous sedation, depending on each patient’s unique medical requirements and whether the procedure is performed alone or in conjunction with other facial enhancement procedures. Recovery after this surgery usually requires several days of downtime, even if no other procedures have been performed simultaneously. Patients will generally experience minimal bruising and swelling around the jaw, ears, and neck, but any post-operative bruising should subside within a day or two of the procedure. The initial results of the Necklace® Neck Lift will be immediately apparent after surgery, and will continue to gradually improve over the next 1-3 months. Dr. Moelleken and his staff Moelleken Plastic Surgery will ensure that each patient receives the highest quality of care throughout the entire aesthetic enhancement experience. Our top priority is providing every patient with safe, effective cosmetic surgery and ensuring beautiful, natural-looking results. Our experienced and caring staff understands how precious your time is, and will take care to ensure that your surgery fits conveniently into your busy schedule. Dr. Moelleken will provide a comprehensive overview of your treatment options and procedural details, creating a customized surgical plan designed to address your specific needs and give you a naturally-beautiful neck. If you would like to learn more about whether a NeckLace® neck lift might be right for you, please contact Moelleken Plastic Surgery today. We look forward to speaking with you, and to scheduling your initial consultation with Dr. Moelleken.